In a recent Vox eBook, leading economists re-examined the case for issuing GDP-linked bonds (Benford et al. 2018). The theoretical benefits are well known: a reduction in the risk of a sovereign default (Shiller 1993), the ability to implement a more countercyclical fiscal policy1 (Borensztein and Mauro 2004), and an increase in the fiscal space (Ostry and Kim 2018). However, sovereign state-contingent bonds, in particular growth-indexed bonds (GIBs), have rarely been issued in practice despite their theoretical benefits. In a recent paper (Acalin 2018), I suggest a possible explanation for this apparent sovereign noncontingency puzzle2 by deriving the impact of GIBs on the upper tail of the distribution of the public debt-to-GDP ratio. First, they narrow the support of the debt distribution. Thus, for a given expected value, they decrease the upper tail of the distribution, implying a lower risk of a debt explosion (Blanchard et al. 2016). Introducing GIBs on a large scale in advanced economies could substantially reduce ‘tail risks’ associated with explosive debt paths starting from today’s high ratios. Second, and going the other way, they likely require a premium, which leads to a higher expected value of debt, shifting the distribution of debt and its upper tail upwards, and thus increasing the risk of a debt explosion. In a first set of simulations, I assume that GIBs do not require a premium compared to traditional plain-vanilla bonds. Put another way, I assume a no-arbitrage condition for risk neutral investors: the expected return on GIBs is equal to the return on plain vanilla bonds.3 Using the methodology developed in Blanchard et al. (2016), I simulate the debt distribution after ten years under three scenarios: nonindexed debt, fully indexed debt, and partially indexed debt. I assume in the third case that 20% of the stock of debt, a proportion similar to inflation-indexed bonds in some countries, is composed of GIBs. 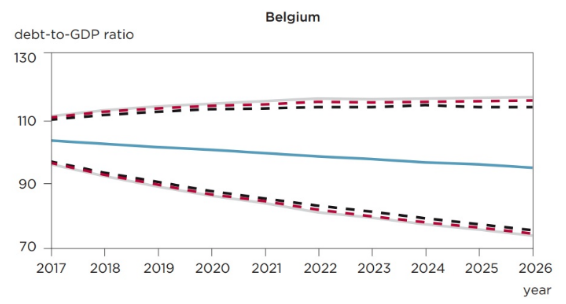 Figure 1 shows the result of the simulations for Belgium and Spain. Note: The lines represent the 1st and 99th percentiles of the debt-to-GDP distribution for debt that is non-indexed debt (grey), all growth-indexed (black), and 20% growth-indexed (red). By construction, the 50thpercentile (baseline) is the same for all cases (blue). 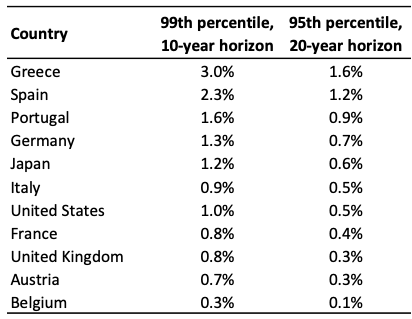 In order to compare the reduction in ‘tail risks’ across countries, I define the following metric: I take the value of the 99th percentile of the debt distribution after ten years under (full and partial) indexation and find the percentile of the non-indexed distribution associated with this value (Table 1). 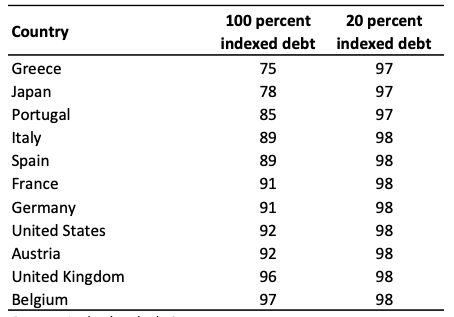 For example, if France converts all its debt into GIBs, the value of the 99thpercentile of the indexed debt distribution after ten years is equal to the value of the 91stpercentile of the non-indexed debt distribution. Put another way, if there is a 9% probability that the debt-to-GDP ratio will reach a level higher than a given threshold after ten years, this probability drops to less than 1% if all debt is composed of GIBs. Unsurprisingly, the gains from indexation vary from one country to another. Countries with a high debt-to-GDP ratio and/or a volatile interest-growth differential – such as Greece, Italy, and Spain – are more likely to benefit from indexation. On the other hand, countries with a less volatile interest-growth differential, a more volatile primary balance, and/or a low debt ratio – such as Austria or Belgium – are less likely to benefit from indexation. More strikingly, for all countries in the sample, an indexation of only 20% of the stock of debt to the nominal growth rate would provide almost no reduction in the upper tail of the distribution. Thus, GIBs would offer little protection against spikes in the debt ratio unless they constitute a large share of the debt stock – and even then, only in countries in which growth volatility is high relative to the volatility of the primary balance. What is the maximum acceptable net premium? More specifically, I compute the premium that equalizes the values of the 99thpercentile of the indexed distribution using GIBs to that of the nonindexed distribution after ten years (Table 2). For euro area countries, the net premium ranges from 30 basis points for Belgium to 300 basis points for Greece. However, the maximum premium drops substantially and is below 100 basis points for most countries as we take a longer horizon (20 years) or a more conservative value for the upper tail of the distribution (95th percentile). Put another way, an increase in annual interest expenditures by 1% of GDP, considering a representative country with a debt-to-GDP ratio close to 100%, may prove to be too high to justify the issuance of GIBs. A high premium would increase the risk of a debt explosion rather than decrease it. The relatively low benefits implied by a small issuance of GIBs and a potentially high premium could explain the apparent noncontingency puzzle. This suggests that a large and coordinated action is a necessary condition to move the equilibrium from a situation of non-indexed to growth-indexed sovereign debt. Although there is renewed interest in GIBs in the euro area context, it seems unlikely that they will be issued by individual countries. A main impediment to market development is overcoming the first-mover problem and the stigma associated with it. A joint issuance through securitisation could take care of the problem while reducing the potential premium and allowing countries to issue such bonds at a large scale. The scheme is presented below and summarised in Figure 2. The mechanism I describe is an extension of the securitisation scheme described by Brunnermeier et al. (2011, 2017) at the euro area level. The coordination of debt issuance can be made by a European Debt Agency (EDA). This agency could be the ESM, an ad hoc entity, or even private financial intermediaries. However, it seems more natural to delegate these operations to a European debt management office. Each country would issue GIBs up to 60% of their own GDP.Above this threshold, countries would continue to issue individual traditional plain-vanilla bonds. On its assets side, the EDA buys GIBs from the euro area countries. The buying price of country-specific GIBs should be such that the expected return on a GIB (adjusted for forecasted GDP volatility) is equal to the return on a plain vanilla bond over the maturity of the bond. This guarantees that sovereign risk is not mispriced, and that there is no ex ante redistribution by pooling debt from countries with a low sovereign risk and countries with a higher risk. Thus, this mechanism would still impose some market discipline on highly indebted sovereigns. On its liabilities side, the ESM issues two kinds of bonds: a European safe asset (paying a fixed interest rate) and a European junior asset (paying a variable interest rate). Theoretically, by pooling all GIBs and collecting a small premium on national GIBs, the EDA can issue a safe European bond paying a fixed and low interest rate. The junior bonds carry all the GDP risk – the return of junior bonds will depend on the deviations of average euro area nominal growth rates to forecast. To be more explicit, if the average euro area growth is higher than expected then junior bonds pay more (as countries will pay more on their GIBs to the EDA). Conversely, junior bonds pay less if average growth is lower than expected. Moreover, the higher the share of safe asset issuance then the higher the volatility of the return on junior bonds. The two debt instruments issued by the EDA are more likely to find potential buyers than individual GIBs. On the one hand, the case for a European safe bond is clear and many propositions have already been proposed to create such an instrument (Leandro and Zettelmeyer 2018). 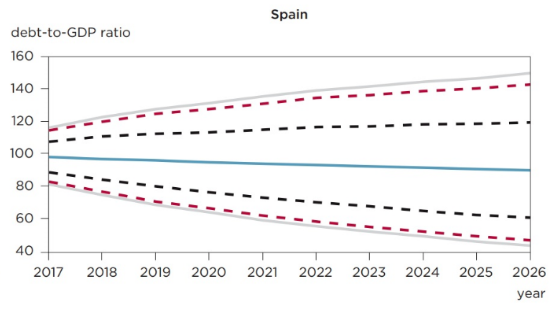 On the other hand, this European junior debt could be less risky than country-specific GIBs for two reasons. First, by pooling idiosyncratic risks from different countries, the variance of the return should be lower as growth rates are imperfectly correlated across countries. Second, and more importantly, the fact that the value of junior bonds is indexed to the euro area performance should provide some reassurance to investors that the probability of high losses is limited. Indeed, if the European junior bond pays a lower return, i.e. if the euro area is performing poorly on average, it is more likely that the ECB will decrease its main interest rate (to the extent that down breaks in growth are cyclical rather than structural), which would support the price of the junior bond. It allows sovereigns to issue a large share of GIBs while keeping the premium at a low level, thus maximising the benefits from GIBs. It offers a fiscal space to countries which need it, and when they need it, while avoiding a mispricing of sovereign risk and ex anteredistribution among European countries. It implies the creation of a European safe asset while keeping the junior bond attractive to investors. The persistent effects of the global financial crisis as well as the current limits on fiscal and monetary policies in advanced economies are forcing us to think about innovative frameworks. The combined used of growth-indexed bonds and securitization could prove fruitful in the euro area context. Going forward, this proposition would also be consistent with a broader rethinking of monetary policy from inflation targeting towards nominal GDP targeting as recently recommended by prominent economists (Summers 2018). Acalin, J (2018), “Growth-indexed Bonds and Debt Distribution: Theoretical Benefits and Practical Limits”, PIIE Working Paper 18-7. Benford, J, J D Ostry and R Shiller (2018), Sovereign GDP-Linked Bonds: Rationale and Design, A VoxEU.org eBook, CEPR Press. Blanchard, O, P Mauro and J Acalin (2016), “The Case for Growth-Indexed Bonds in the Advanced Economies Today”, PIIE Policy Brief 16-2. Borensztein, E, and P Mauro (2004), “The Case for GDP-Indexed Bonds”, Economic Policy 38: 165–216. Brunnermeier, M K, L Garicano, P Lane, M Pagano, R Reis, T Santos, D Thesmar, S Van Nieuwerburgh, and D Vayanos (2011), “European Safe Bonds (ESBies)”, Euronomics Group. Brunnermeier, M K, S Langfield, M Pagano, R Reis, S Van Nieuwerburgh, and D Vayanos (2017), “ESBies: Safety in the Tranches”, Economic Policy 32(90): 175-219. Leandro, A and J Zettelmeyer (2018), “Safety Without Tranches: Creating a ‘real’ safe asset for the euro area”, CEPR Policy Insight No. 93. Levy, A (2016), “The claim is bond, GDP-indexed bond. The noncontingency puzzle: limitations to sovereign risk-sharing”, Master’s thesis, Paris School of Economics. Ostry, J D and J Kim (2018), "Boosting Fiscal Space: The Roles of GDP-Linked Debt and Longer Maturities", IMF Departmental Paper No.18/04. Shiller, R J (1993), Macro Markets: Creating Institutions for Managing Society’s Largest Economic Risks, Clarendon Press. Summers, L H (2018), Why the Fed needs a new monetary policy framework, Hutchins Center on Fiscal & Monetary Policy, Brookings. Assuming GDP-linked bonds are held by nonresidents. However, if residents hold such indexed bonds, their interest revenue will increase during good times and decrease during bad times. This procyclicality in their income may reinforce, rather than smooth, the economic cycle if not more than offset by an appropriate and well-targeted countercyclical fiscal policy. The term ‘noncontingency puzzle’ was originally coined by Levy (2016). For example, if the expected nominal growth rate over ten years is 2% while the ten-year interest rate on plain vanilla bonds is 4%, then the GIB pays the nominal growth rate plus a constant k equal to 2%: rateind,t = ratet + k. This constant k is different from what I refer to as a premium. More research on the different components of the net premium would be valuable. Again, sovereign risks reflected in plain vanilla bonds are fully priced in GIBs and reflected in the constant k added to the indexed return. The threshold could be different than 60%.